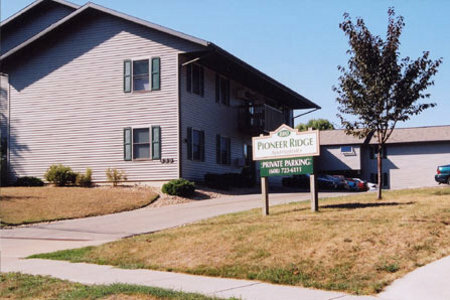 Pioneer Ridge is located at 880 Union St., two blocks north of campus. It has ten 4-bedroom/2-bathroom units. The apartments are large and spacious. They have large decks or patios with large overhangs, which allow for use in bad weather. All units are furnished with couch, love seat, coffee and end tables, dining table and chairs, plus a chest of drawers. The kitchen has a stove, refrigerator, dishwasher, and range hood. There is plenty of FREE parking for your bike, scooter, or car; and snow and garbage removal is included in your rent. There are two large storage areas in each apartment. There is FREE high-speed WIFI internet which is an $80-$100 savings for you each month. Each apartment has it's own free washer and dryer in a separate utility/storage room. There is covered parking for your bicycles. Our buildings are insulated far beyond the required codes, and each room has its own heat source and thermostat so you don't have to heat up the entire apartment to warm just one room. You can be assured you will not have high utility bills. © Copyright 2019 Arrow Properties, LLC. Page created by Netux Solutions.